I am taking a rest this week, as I received a weekly newsletter by Paul Kruger, PGA, The Landings Club, Savannah, GA, on a subject that I have not previously covered in detail. Rather than write a similar blog from scratch I have obtained Paul’s permission to copy his article about playing a wrong ball, in full and without change. Per Rule 15-3 -Wrong Ball, the penalty for playing a wrong ball is loss of hole in match play and two strokes in stroke play. One of the most demoralizing penalties one can incur is that of playing a wrong ball. Why? Because Rule 12-2, Lifting Ball for Identification, gives you the authority to identify your ball anywhere on the course. Thanks to this Rule, you can be absolutely sure you are playing your own ball, thereby avoiding the ignominy of playing a stray ball or someone else’s ball in play by mistake. To assist you in identifying your ball, Rule 12-2 recommends that you should put an identification mark on your ball. In match play, if you are doubtful of your rights or the correct procedure to follow when taking relief, you must resist any temptation to play a second ball. Playing a second ball under Rule 3-3, Doubt As To Procedure, is restricted to stroke play only! According to Decision 3-3/9, Second Ball Played in Match Play, if you play a second ball in match play, you will be incur a loss of hole penalty for playing a wrong ball. If, after a brief search for your original ball, you put another ball into play under Rule 27-1, Stroke and Distance; Ball Out of Bounds; Ball Not Found Within Five Minutes, you must continue play with the substituted ball, even though you then find your original ball within the five minute search period. Per Decision 15/5, Original Ball Found and Played After Another Ball Put into Play, your original ball became lost when you put the substituted ball into play under Rule 27-1. If you then abandon the substituted ball and play a stroke with the original ball, you will have played a wrong ball. See also Decision 27-1/2.3, Original Ball Found Within Five-Minute Search Period After Another Ball Dropped; Original Ball Played. If you play a stroke at your ball which is lying out of bounds, you will be playing a wrong ball. See Decision 15/6, Stroke Played with Ball Lying Out of Bounds, and Decision 18-2b/9, Ball Moves After Address and Comes to Rest Out of Bounds; Player Plays Ball. The Definition of Ball in Play indicates that a ball in play is no longer in play when it is out of bounds. Decision 15/9, Ball Thrown Into Bounds by Outside Agency and Played; Caddie Aware of Action of Outside Agency, describes an unusual set of circumstances wherein a caddie withholds vital information from his player. 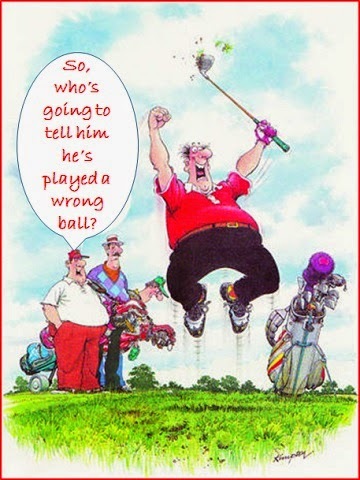 Choose your caddie wisely so that you do not unwittingly play your original ball after it has been tossed back in bounds! If you find your original ball after a search exceeding five minutes, that ball is lost (see Definition of Lost Ball). Should you then play that ball, you will be playing a wrong ball. The Definition of Ball in Play indicates that a ball in play is no longer in play when it is lost. See Decision 27/8, Ball Found After Search Exceeding Five Minutes Is Then Played. If you play a provisional ball pursuant to Rule 27-2, Provisional Ball, for your original ball that may be lost or out of bounds, be careful not to continue play with your original ball after playing your provisional ball from a point nearer the hole than where your original ball was likely to be. See Decision 27-2b/5, Original Ball Played After Provisional Ball Played from Point Nearer Hole Than Original Ball Is Likely to Be, and Rule 27-2b, When Provisional Ball Becomes Ball in Play. A good, comprehensive coverage of playing a wrong ball. Thanks Paul! Welcome to all those that have recently subscribed to my blogs following my '3 Interesting Rules of Golf Blogs from 2014' email that was sent to the separate 'Rhodes Rules School' mailing list. If you are not already on this list for my free, weekly 'Rhodes Rules School' emails, click here. I was playing my opponent in a match play game, when his 2nd shot to a par four green appeared to go out of bounds. He played a provisional ball and then looked for his original ball. I was surprised when he announced that he had found his original ball in a ditch within bounds, because it appeared to be beyond the place that his original ball had appeared to go out of bounds. He took a penalty drop and finished the hole with the ball he had found in the ditch, abandoning his provisional ball. He then played the next 5 holes with that ball, winning the game 3/1. We elected to play the last hole, as we walked to the 18th tee, he announced that he had just discovered that the ball that he had found in the ditch, although of the same make, was NOT his original ball. His original ball had an asterisk drawn on it, whilst the ball that he had played for 5 holes in a row did not have an identity marking. I realise that playing the wrong ball meant that he had lost the hole on which the original error took place, but what is the situation with him playing that ball for the next 4 holes please? Any ball that a player starts a hole with is their ball in play. It does not matter that it was a wrong ball from a previous hole. The player did lose the hole on which he wrongly substituted the ball for giving you wrong information, Rule 9-2. The adjustment to the match should be made as soon as he admitted to his error, even though no valid claim was made before commencing play at the next teeing ground, Decision 9-2/8. What is the ruling playing in a fourball match competition? My partner played a wrong ball of a group coming up a hole behind us. With it being matchplay, does the team lose the hole or is it just him that is out of the hole. Many thanks for your help. If a player incurs the loss of hole penalty under Rule 15-3a for making a stroke at a wrong ball, he is disqualified for that hole, but his partner incurs no penalty even if the wrong ball belongs to him. If the wrong ball belongs to another player, its owner must place a ball on the spot from which the wrong ball was first played. "Any ball that a player starts a hole with is their ball in play. It does not matter that it was a wrong ball from a previous hole. The player did lose the hole on which he wrongly substituted the ball for giving you wrong information, Rule 9-2. The adjustment to the match should be made as soon as he admitted to his error, even though no valid claim was made before commencing play at the next teeing ground, Decision 9-2/8"
But am I right to think that would not be the case if played the wrong ball in a four-ball better ball comp (as my partner did on Saturday) then continued for two further holes before the mistake was spotted. He would have been disqualified in singles strokeplay/stableford I think, but in fbbb format, does he fail to score on those three holes but can continue once declaring the identity of his new ball on the next tee. First, I must point out that the quote that you have taken from an earlier reply was in the context of match play. You are not quite right in your interpretation; in a strokes competition a player is disqualified if they play a wrong ball and do not rectify the situation before commencing play of the next hole; in a singles Stableford competition the player is disqualified for just that hole; in a four-ball better-ball competition the player is disqualified for just that hole but their partner is not.